Inkjet printers have been the most common printers in homes and offices since the 1990s. Two things have made them extremely popular: they are relatively inexpensive and they produce high-quality images. Despite the fact that these printers have been around for a long time and don't cost much, the technology inside them is complex. Understanding how your printer works will make it clear what the printhead is, what the cartridge is and how they work together. How Do Inkjet Printers Work? Inkjet printers use thousands of microscopic nozzles to transfer ink onto paper. Extremely precise, each nozzle has a diameter of about 10 micrometers – that's about 1/10th the size of a human hair. Ink is supplied to the nozzles from a reservoir contained in a cartridge. The nozzles are mounted on a printhead and the printhead is mounted on a carriage that moves across the page at a speed of about 1 meter per second. The printhead is positioned about one millimeter from the paper, through which the nozzles spray the ink at a velocity of about five-to-10 meters per second. While inkjet printers all use the same process for applying ink to paper, how the technology is assembled can vary greatly. Depending on the printer manufacturer and brand, the printhead may be part of the cartridge or part of the printer. Manufacturers like HP and Dell, for example, integrate the printhead directly into the replaceable ink cartridges. Other manufacturers, like Epson and Canon, integrate the printhead into the printer. Integrating the printhead into the cartridge or into the printer can each have advantages and disadvantages. Some maintain that having the printhead separate from the cartridge eliminates waste and reduces the cost of replacement cartridges. Others believe the cost of the printhead is minimal and having a new printhead with every cartridge reduces the need for cleaning the printhead. Either way, it is largely a matter of personal preference. If ink didn't dry, handling documents would be a very messy affair! Just as printer ink can dry on paper, it can dry inside a cartridge and in a printhead. This is why printer cartridges are shipped in vacuum-sealed bags and often have expiry dates. In order to preserve the life of your printer cartridges, you should not open the bag until you are ready to install the cartridge in your printer. Using your printer regularly is the best way to ensure that the ink doesn't dry out in the cartridge or in the printhead. 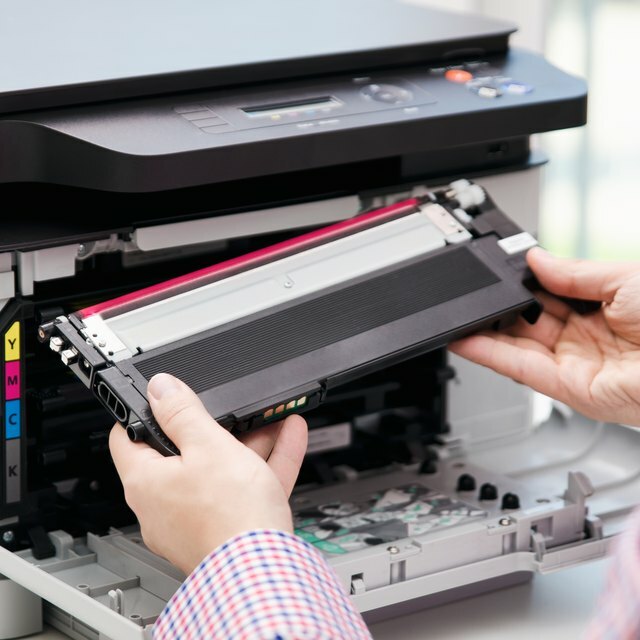 If you don't plan to use your printer for a while, you can try storing the cartridge in an airtight plastic container, along with a damp cloth to keep the air inside the container moist. Store the cartridge in an upright position, and if it came with a piece of tape when you bought it, place the tape back over it in the same position. If you need to clean a printhead, due to dried ink or dust, most printers come with a pre-programmed cleaning function, which should clean it out. If this doesn't work, you can purchase a printer-head cleaning kit. Another way to clean printheads that are attached to the cartridge is to remove the cartridge and blot the printhead on a damp paper towel. This can often get the ink flowing, which will wash out any dried ink in the printhead. Once you've blotted it a few times, repeat the process with a dry paper towel before replacing the cartridge in the printer. Compredia: What Is a Printhead? LD: Do Printer Cartridges Expire?